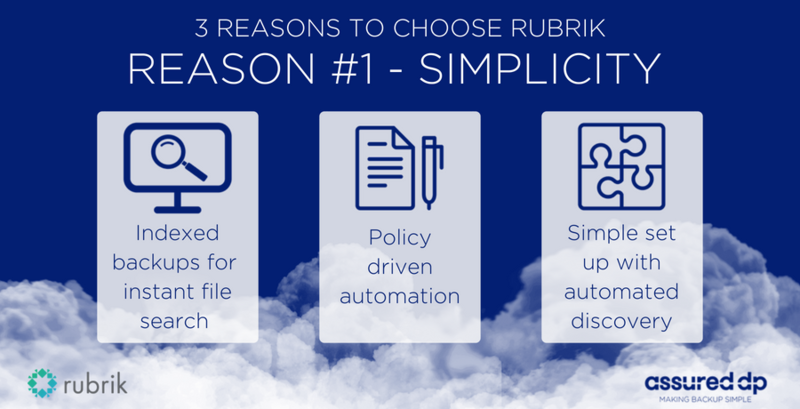 As a product Rubrik was born from the basic idea of simplicity across cloud usage. Starting with a fresh piece of paper and fresh ideas, Rubrik was created from scratch rather than like many competitors, who have used old backup and data protection solutions as the core then developed the product through cloud ‘add ons’. This ‘blank piece of paper’ approach means that the software has been designed to a specific specification and developed around the everyday challenges that backup teams face on a daily basis. Making everyday issues a much simpler process and less time consuming. Rubrik has many elements that contribute to the ease and simplicity of use, here we’ll focus on just three and take a deeper look at how they contribute to the simple approach. Deliver near-zero RTOs with ‘Google like’ predictive search. Locate VMs, databases, applications, or files, whether the data resides on-prem or in the cloud. Rubrik wipes out management complexity with just a few clicks through a single policy engine that orchestrates service level agreements (SLAs) across the entire data lifecycle. Allowing you to automate management across hybrid and multi-cloud environments with one programmatic, simple interface. With a plug in and go style approach to set up Rubrik’s initial set up quick and easy with automated discovery of your entire infrastructure, in no time. Meaning next to none resource input required. Simplicity is key to backup, it shouldn’t be time consuming or difficult and Rubrik only confirms that. This entry was posted in Backup, Rubrik and tagged Assured DP, Backup, Cloud, Data Backup, Data Protection, disaster recovery, Rubrik. 4 reasons you need backup!